DESIGN102 has been using Adobe After Effects software for some time to produce animations. However, the software is also capable of adding visual effects to live action footage. Knowing that an upcoming job was going to require this I decided to brush up on my skills. The footage for the job hadn’t been edited yet, so as a trial run I set myself the task of adding some visual effects to a video that I had to hand (literally) on my phone. One of the benefits of being based on the top floor of a building in central London is the view. 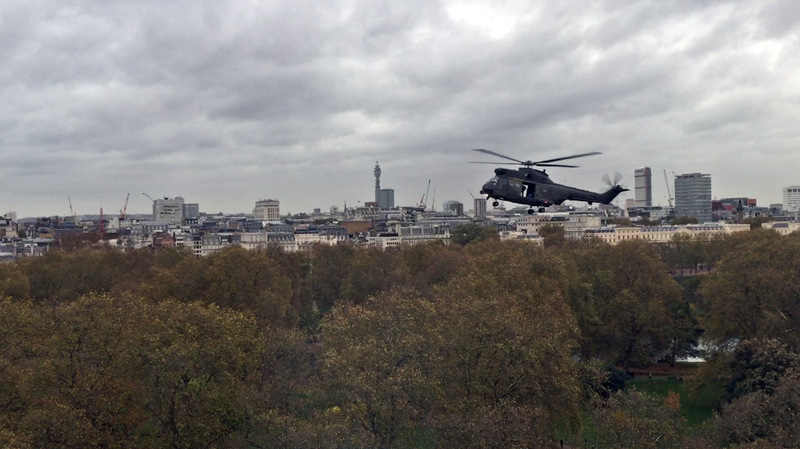 We have seen events such as Tour de France, RAF flybys and army parades for visiting dignitaries pass by our window. 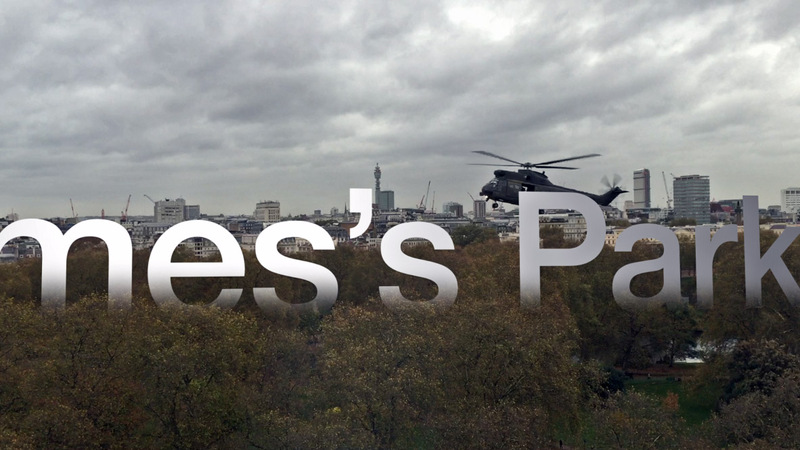 Similarly, I recently filmed a helicopter descending over London. I used this as my live action footage. I decided to add some captions to the footage. Not just static captions though – I wanted something eye-catching. First I added a caption to show the location of the video. I wanted to make the caption look like it was emerging from the trees. To do that I set After Effects to analyse the footage to add tracking points. These are reference points which allow After Effects to estimate the location of fixed areas in the footage. The points are used as 3D reference points which allow the inserted caption to skew and rotate while the footage is played, making it look like the caption has been placed in the actual park. I added a gradient to the bottom of the text to make it look like a shadow. Looking good, but the helicopter is flying behind the caption. 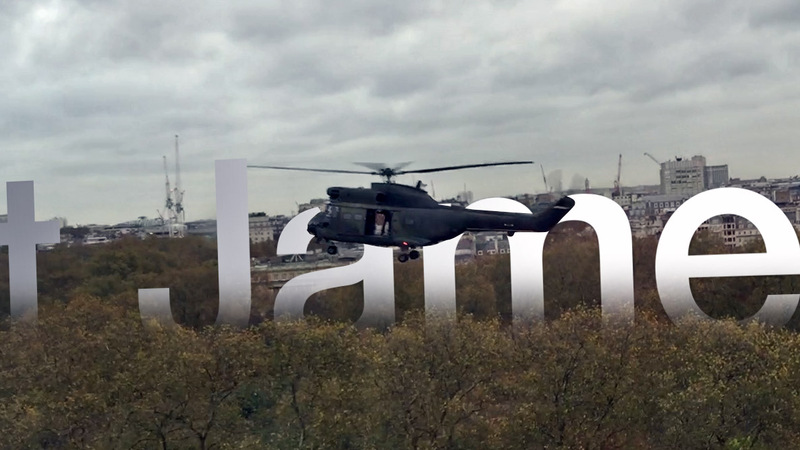 To add a bit of dimension I wanted to make the helicopter look like it flies through the caption. To do this I drew a mask around a still frame of the helicopter. After Effects then used the mask to determine where the helicopter appears in the rest of the footage and moves the mask automatically frame by frame. Clever stuff. It’s not flawless though so manual corrections are needed. 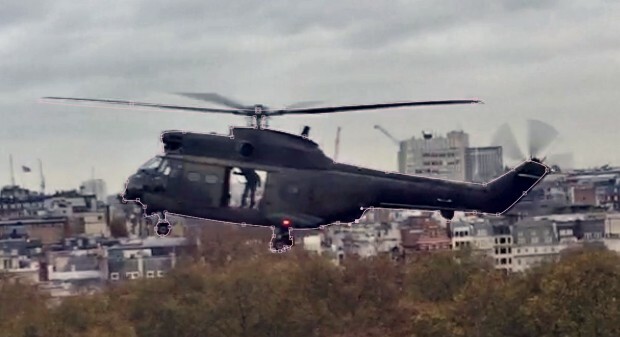 I then created a new layer in front of the caption layer, pasted the cutout helicopter into it and set it to appear initially invisible. At the relevant time in the footage I set the cutout to become visible which made it look like it was flying in front of the caption. Next I wanted to add an altitude meter to show the [completely made up] height of the helicopter. I animated the numbers by applying a countdown effect to them. I also added a simple animated down arrow which played on a loop. To make it look more dynamic I made the meter track the helicopter. I did this by telling it to follow the same path as the helicopter mask that I had already made.